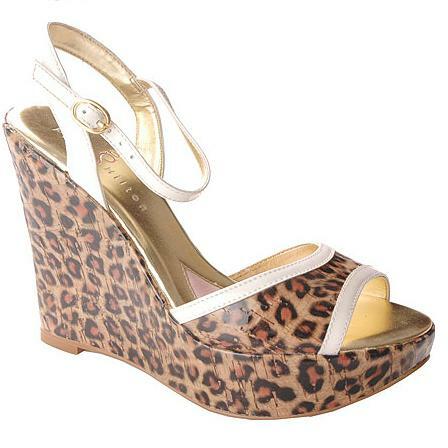 This sassy open toe Cheetah print sandal on a platform heel will have heads turning in your direction. Features an adjustable strap for secure fit and a white patent leather upper for added styling. Paris Hilton footwear, designed to be chic and trendy, is perfect for the fashion-forward young woman who wants to look and feel great from head-to-toe, without spending a fortune. Paris Hilton footwear is produced with high quality components and finished with unique details. The collection features a range of styles, from stilettos and platforms to stylish flats, wedges and a sport collection. Paris has personally chosen the styling, design, materials and colors for her collection. Each and every shoe in her collection features pink soles and a heart shaped comfort pad sewn into the inner sole, so you can dance and party all night long.